'The Kid Who Would Be King' Releases Official Trailer & Posters - Watch! 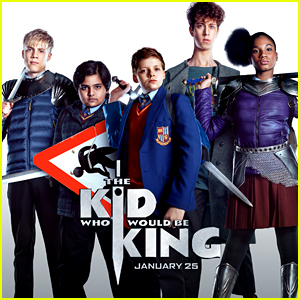 The Kid Who Would Be King just released a new trailer, which you can watch right here! The upcoming movie tells the story of Alex, who thinks he’s just another nobody, until he stumbles upon the mythical Sword in the Stone, Excalibur. He must unite his friends and enemies and, together with the legendary wizard Merlin, take on the wicked enchantress Morgana to become the great leader he never dreamed he could be. The film is written and directed by Joe Cornish and stars Louis Ashbourne Serkis, Dean Chaumoo, Tom Taylor, Rhianna Dorris, Angus Imrie, Rebecca Ferguson and Patrick Stewart. The movie opens in theaters everywhere on January 25, 2019. Watch the trailer below! Idris Elba Brings Daugther Isan to 'Dark Tower' NYC Premiere, Plays 'Google Translate' Songs on 'Tonight Show'! 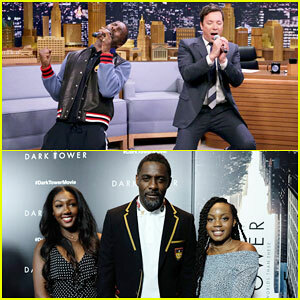 Idris Elba had a little fun with Jimmy Fallon during his appearance on The Tonight Show on Monday (July 31) in New York City. The 44-year-old actor played a game with the 42-year-old host called “Google Translate Songs” where they sang some famous tracks like Sir Mix A Lot‘s “Baby Got Back” and Boyz II Men‘s “I’ll Make Love to You,” but translated the lyrics using Google – which doesn’t always give you the exact translation. That same evening, Idris switched up his outfit to join his daughter Isan Elba and her gal pal at the special New York screening of his latest film Dark Tower held at the New Museum of Modern Art. Idris was also joined by his co-stars Kathryn Winnick, Abbey Lee, Fran Kranz, Tom Taylor, Michael Barbieri, Eva Kaminsky, director Nikolaj Arcel, as well as Whoopi Goldberg and Dionne Warwick, who came out to show their support. FYI: Idris is wearing Gucci. Katheryn is wearing a Marchesa dress, Schutz shoes, Lorraine Schwartz ruby earrings and rings. Eva is wearing a Saloni dress. 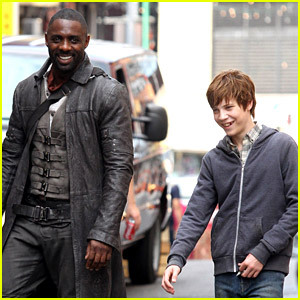 Idris Elba Films 'Dark Tower' Scenes with Tom Taylor as Jake! Idris Elba is all smiles while filming The Dark Tower scenes alongside his young co-star Tom Taylor on Thursday (July 7) in New York City. Tom is playing the role of Jake Chambers, an eleven-year-old boy who becomes the symbolic son of Idris‘ character Roland/The Gunslinger. The first installment of Stephen King‘s series of novels focused on the two characters developing their relationship. Idris has been seen filming the movie over the last week in the Big Apple with co-star Matthew McConaughey.